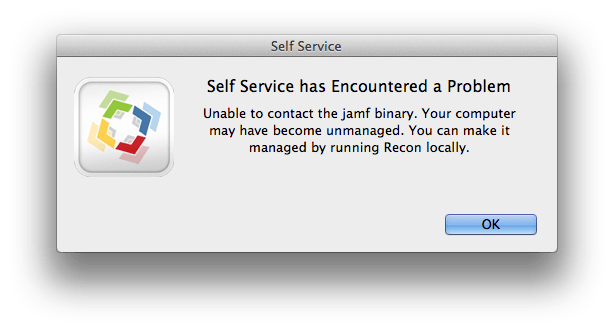 UPDATE: We've since updated to JSS 9.3 & we no longer have this issue. We recently updated our JSS from 8.73 > 9.22 & on the whole it’s been a non-event. However, we started to find that some Self Service policies were erroring with the below message post the upgrade. One of the DMG’s we were having issues deploying was called “012 SAPGUI Settings.dmg.” Via a Policy or Casper Remote it deployed fine, only errored via Self Service. Even though the name appeared to have no special characters, it looks like the spaces were somehow causing issues. Replacing the spaces with underscores so the DMG read: “012_SAPGUI_7.20rev5_Settings.dmg.” After which it deployed fine via Self Service. I then checked through & swapped spaces for underscores on the other couple of DMG’s that had issues via Self Service. Just ran into the same issue today, and luckily your blog came up as the first result. Sure enough after removing some spaces from a couple test packages, they were working fine from self service. Thanks for posting your discovery! Had the same issue with a few teacher machines today. Went through and changed all of our DMG package names just to be safe.